Gordon Shedden became the first driver in eight years to win back-to-back Dunlop MSA British Touring Car Championship (BTCC) titles with a superb performance at Brands Hatch GP this weekend (1-2 October) behind the wheel of his Halfords Yuasa Racing Honda Civic Type R.
Shedden entered the weekend trailing championship leader Sam Tordoff by 11 points in the chase for the most coveted trophy in British motor sport. By out-qualifying his chief rival and finishing ahead of the Yorkshireman in all three races, however, the defending champion dramatically turned the tables for a popular success. From seventh on the starting grid, Shedden carved his way through to finish fifth in race one before pulling off some opportunistic passes as he battled to his ninth podium of the season in race two. Beginning the finale from fifth - and needing to beat Tordoff, two places ahead of him on the grid, in order to lift the laurels - the Scot produced one of the drives of his career. With the championship poised finely on a knife-edge, he grabbed his flame-spitting Civic Type R by the scruff of its neck and secured the spoils in style, overhauling his BMW adversary en route to third place at the chequered flag to snare the title by two points. Team-mate Matt Neal should similarly have been in with a shout going into race three having converted 11th on the grid into seventh in the opener, but just after posting the fastest lap in race two, the three-time champion's engine temporarily cut out and as he attempted to rejoin, contact with another car sent him into a dizzying spin and into the barriers. Suffering from mild concussion, he was unfortunately ruled out of the all-important finale. 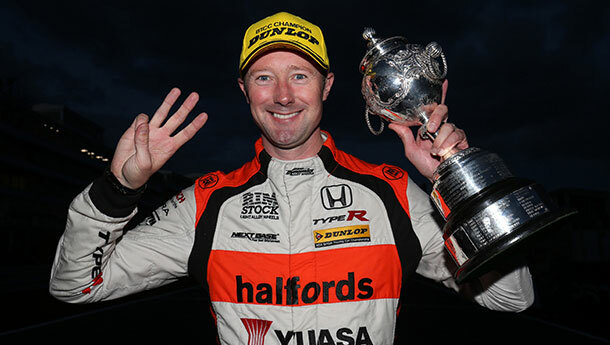 That relegated Neal to sixth spot in the Drivers' standings - albeit just 33 points adrift of newly-crowned champion Shedden - with Honda and Halfords Yuasa Racing placing second in the Manufacturers' and Teams' tables respectively. "It's unbelievable - an incredible feeling. I've actually been really relaxed all weekend, but even going into race three, I thought it was going to be very difficult - and it was! It was a shame Matt couldn't join in - it would have been good to have him up there pushing for the title too, because we've both had really strong pace today. The Civic Type R was mint throughout - as it has been all season - and once again, I really stuck my neck on the line and made some bold, heart-in-the-mouth moves that were on the edge more often than not. After Croft in June, it looked like we were down-and-out in the title battle, but we stuck to our guns, kept plugging away and gave it absolutely everything to claw our way back. It just goes to show that every single point really does count in this championship. Winning the BTCC title for the first time felt phenomenal, last year was a real rollercoaster ride and this year it was just a huge release of emotion. I might allow myself a few cups of tea and a Tunnock's Teacake tonight to celebrate..."
"First of all, huge congratulations to 'Flash' on his third BTCC crown. He's driven fantastically all season and it's a pleasure to welcome him to the 'three titles' club - I guess now it'll be a straight fight to see who can get to four first! Seriously, though, I'm chuffed for him and he thoroughly deserves it - if I couldn't win it, there's nobody else I'd rather see lift the trophy. It was obviously a shame about the way my season ended. We did a solid job in qualifying and closed in on the championship lead in race one, but then in race two, I suddenly lost power and as I was attempting to recover, I was pitched into a spin that ended up in the barriers. I got knocked around pretty badly and because I had mild concussion, the decision was taken not to start race three, which clearly wasn't the way I wanted to end my championship challenge. Still, I'll just have to come back next year and try to win it again myself!"